The 1GR-FE is a 4.0-liter V6 gasoline engine designed by Toyota for SUVs and RWD/4WD pickups. This 4.0-liter member of The Toyota GR engine family, together with 3.5-liter 2GR-FE, replaced the previous MZ V6 engines. The 1GR was first available in 2002 in the Toyota 4Runner and Land Cruiser Prado. 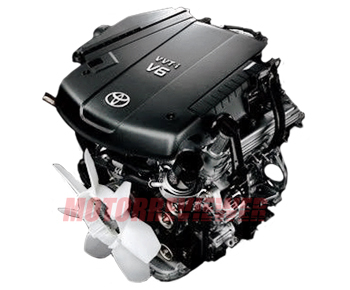 After update in 2009 (Dual VVT-i 1GR-FE), the engine continues his life and still used in some four-wheel drive Toyota and Lexus vehicles like Toyota Tundra and Lexus GX 400. The 1GR engine has an open-deck 60-degree V angle aluminum cylinder block with cast iron liners. Inside the block, there is a forged steel crankshaft with nine counterweights and four main journals, forged connecting rods, and aluminum alloy pistons. The engine uses oil jets mounted inside the engine block which sprayed oil to the bottom side of the pistons for temperature reduction. The piston skirts have a resin coating to reduce friction. The engine has aluminum cylinder heads. The double overhead camshafts are driven by the primary and secondary timing chain. The primary timing chain drives the intake camshafts and then the intake camshaft drives the exhaust camshaft via the secondary chain. The first 1GR-FE engine (until 2009 model year) had the variable valve timing (VVT-i) on the intake. Cylinder heads for this engine have four valves per cylinder. The valves are actuated via shimless type valve lifters. The heads are covered by aluminum cylinder head covers. There is a plastic intake manifold mounted on top of the engine. The intake is equipped with Toyota’s Acoustic Control Induction System (ACIS). The special air control valve varies the effective length of the intake manifold according to engine speed and optimizes the engine output. The Toyota’s Electronic Throttle Control System-intelligent (ETCS-i) system is also applied. The engine uses a sequential fuel injection system with twelve-hole fuel nozzles for each cylinder. The ignition is the Toyota’s DIS ignition. Each cylinder has individual ignition coil integrated into the spark plug cap. Each head has a stainless-steel exhaust manifold (header) with an integrated three-way ceramic-type catalytic converter. In 2009, the Toyota started production of the upgraded version 1GR – the dual VVT-i 1GR-FE engine. That version features not only the variable intake and exhaust valve timing system but also the significant changes in mechanical parts. The bottom of the engine received a new crankshaft with five balance weight, pistons with optimized shape produced 10.4:1 compression ratio versus 10.0:1. The engine also got redesigned cylinder heads. The camshaft housing now is separate and the valves actuated by roller rocker arms with built-in needle bearings. The valvetrain is equipped with hydraulic lash adjusters. The pressure in the injection system was raised from 284 kPa up to 324 kPa. The position of the injector nozzle moved closer to the intake valves. In the intake, the ACIS system was omitted. There is a simple plastic intake manifold and electronically controlled throttle body (ETCS-i). The nickel spark plugs were replaced by iridium-tipped spark plugs (Denso SK20HR11). The Dual VVT-i 1GR has new headers (exhaust manifolds). The reliability of the 1GR-FE is not the best side of that engine and not suitable especially for a work truck or a big family SUV. The engine block of the 1GR-FE has cast-in special thin cylinder liners. Their thin walls make it impossible to bore the block and rebuild an engine with a damaged cylinder wall surface. The common failure for a relatively big mileage 1GR engines (near 150,000 miles) is a blown off head gasket. The water pump is a weak point; its longevity is about 40-50k miles. So, pay extra attention to the condition of the coolant system. The dual VVT-i 1GR engine is smoother and quieter than first 1GR-FE engines. Also, the simple VVT-i engines had non-stop problems with ignition coils. Like a modern engine, the 1GR requires a proper maintenance, high-quality fuel, and engine oil. The engine longevity is over 200,000 miles. After that line, most of the 1GR engines need a new cylinder block.